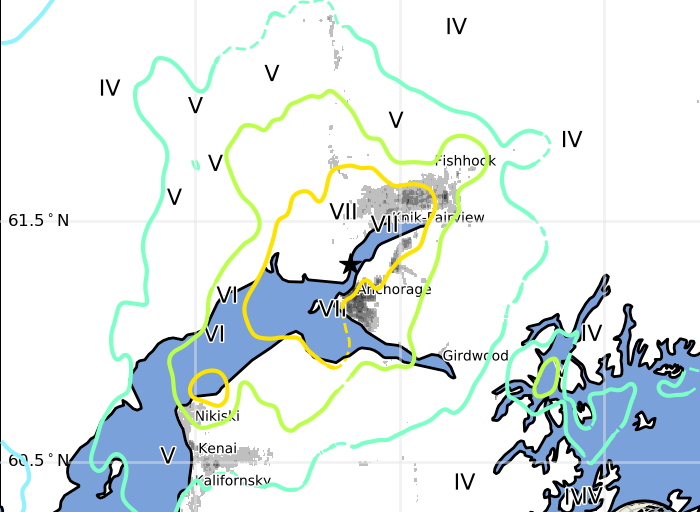 U.S. Geological Survey shake map of the 2018 magnitude-7.0 Alaska Earthquake. Image via Wikimedia Commons. Anchorage, Alaska officials are assessing damage and working towards recovery after a magnitude 7.0 earthquake struck about eight miles north of the city on the morning of Nov. 30. Pictures being shared across the internet and social media show shattered roads and interiors in disarray. As of Dec. 2, the U.S. Geological Survey recorded 166 aftershocks of magnitude-3.0 or higher, according to USA Today. Mayor Ethan Berkowitz declared a civil emergency in Anchorage that day, according to the Anchorage Daily News. On Dec. 1, the Alaska Department of Transportation sent all of its inspectors to inspect bridges, the Associated Press reports. Officials later reported that 40 sites had some type of damage. Later that day, the Federal Highway Commission released $5 million in emergency relief funds to help the state repair its roads and bridges following the quake, according to the AP. On Dec. 2, the Anchorage Assembly voted unanimously to extend its declaration of civil emergency until Tuesday night, the Anchorage Daily News reports. Anchorage Fire Chief Jodie Hettrick implored Anchorage Assembly members to check on residents’ statuses throughout the city, the Alaska Star reports. “I’m asking you guys to work through your community councils to do neighborhood welfare checks,” she said during an emergency assembly meeting Sunday, according to the Star. While road damage was drastic, no deaths and no looting were reported following the earthquake, the AP reports. Additionally, the food and goods supply chain brought to the Port of Anchorage from the rest of the United States was uninterrupted, and structural damage throughout the city was minimal, according to CBS and the AP. Alaska Seismic Hazards Safety Commission member Sterling Strait noted that Alaska and California both use the International Building Code, which is considered the best standard for seismic safety, according to the AP.